SyncQuip Mechanical Group is a construction management firm. They offer in-house sheet metal, commissioning, and service capabilities for their clients' HVAC needs in the commercial, financial, industrial & institutional markets. Their visual identity needs to represent the strength and reliability they offer their clients. Using duct work as inspiration, our Corporate Three Design team created an icon combining both the 's' and the 'q' from the SyncQuip name. The 'q' was created by the addition of the green cutout piece of the hexagon shape surround the 's'. For the SyncQuip name, we created a custom typeface that spoke to the industrial field they work in. The logo is clean, strong, and approachable for the clients they serve. 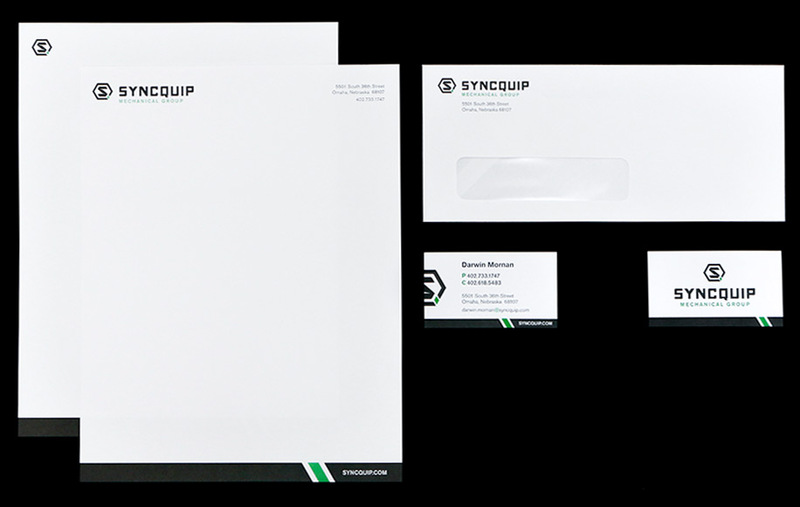 SyncQuip works in a no-nonsense industry, and we kept it that way in their identity package. From the 'q' in the icon, we pulled out the black bar and the green cutout piece to run as a border on the bottom of the business card and letterhead. We used the icon as a design element on the front of the business card, but otherwise kept it simple for their clients, who when the heating or air conditioning is out, have no time to mess around. The next step was to bring their brand online. 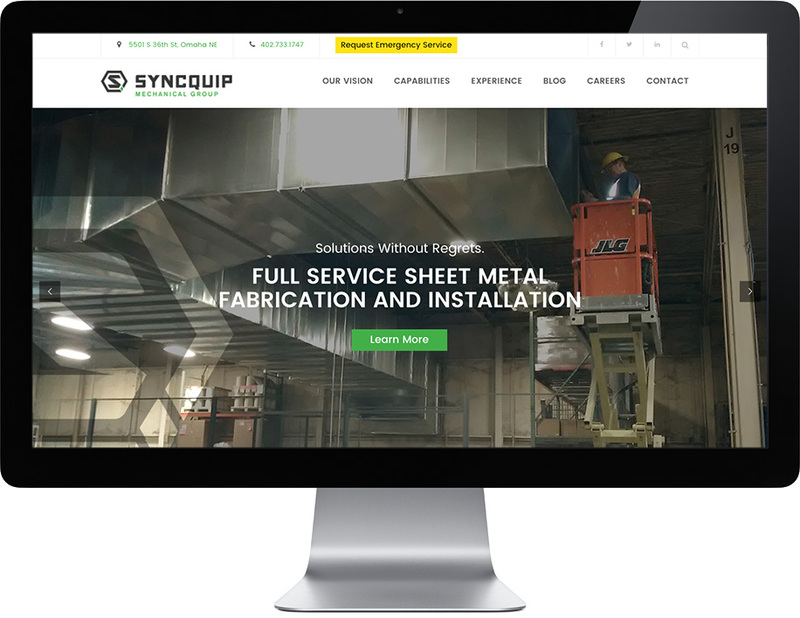 SyncQuip needed more than a brochure site; they needed their website to work for them. For their client's stressful heating or air conditioning emergencies, SyncQuip needed their contact information readily available, so it was added prominently in the header of every page. The site displays their capabilities and the projects they've worked on, but usually that content remains static. For the benefit of search engine rankings, they needed to add content on a regular basis, so we encouraged them to start a blog and update it a few times a month. Part of the site needed to also attract employees, so a page was created to act as the front face for their 3rd party career portal. SyncQuip is a strong company serving the industrial industry. We designed their visual brand with this in mind. Their brand is approachable and conveys the reliability that their clients can expect when working with them.